This week we are joined by the Hugo and Nebula Award winning Paolo Bacigalupi, who is just about to publish his first science fiction novel for adults since 2009s The Windup Girl. 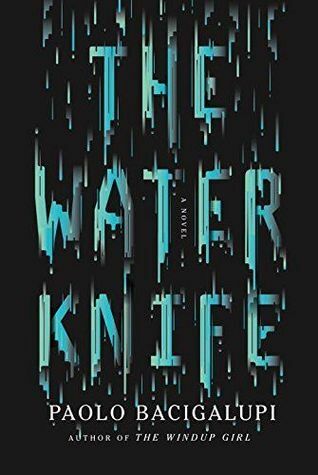 Picking up from where his harrowing short story “The Tamarisk Hunter” left off, The Water Knife is lean thriller that asks important questions about how global warming will affect us all as seas rise in some places and drinking water becomes scarce in others. In the American Southwest, Nevada, Arizona, and California skirmish for dwindling shares of the Colorado River. Into the fray steps Angel Velasquez, detective, leg-breaker, assassin and spy. A Las Vegas water knife, Angel “cuts” water for his boss, Catherine Case, ensuring that her lush, luxurious arcology developments can bloom in the desert, so the rich can stay wet, while the poor get nothing but dust. When rumors of a game-changing water source surface in drought-ravaged Phoenix, Angel is sent to investigate. There, he encounters Lucy Monroe, a hardened journalist with no love for Vegas and every reason to hate Angel, and Maria Villarosa, a young Texas refugee who survives by her wits and street smarts in a city that despises everything that she represents. With bodies piling up, bullets flying, and Phoenix teetering on collapse, it seems like California is making a power play to monopolize the life-giving flow of a river. For Angel, Lucy, and Maria time is running out and their only hope for survival rests in each other’s hands. But when water is more valuable than gold, alliances shift like sand, and the only thing for certain is that someone will have to bleed if anyone hopes to drink. The conversation is, as always, fascinating and provocative. We’re very grateful to Paolo for making the time to return to the podcast and, as always, hope you enjoy the episode. Next Next post: Best Science Fiction and Fantasy Nine is out!